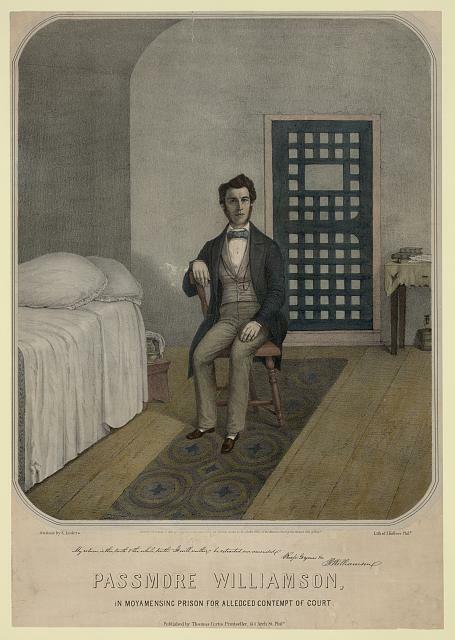 “Passmore Williamson, in Moyamensing Prison for Alledged Contempt of Court” by Emil Luders (lithographer August Kollner), Philadelphia: 1855. An unusual informal portrait of Passmore Williamson, secretary of the Pennsylvania Abolition Society, seated in a prison cell. Williamson was convicted on July 22, 1855, for evasive testimony to a writ of habeas corpus issued by Federal District Court judge John Kane. Williamson’s testimony related to his participation in the emancipation of three slaves owned by U.S. minister to Nicaragua John Hill Wheeler in Philadelphia. Williamson’s imprisonment gave rise to heated public controversy over the issue of states’ rights and the status of slaves traveling through free territory. Judge Kane’s actions were heavily criticized in the press, and Williamson was released from prison on November 3, 1855, after giving slightly modified testimony.